'Viking John, the best-looking student on campus, was now sleeping on a mattresss on the floor of my room. He'd bought his record collection with him. 'What about some Rachmaninov?' he suggested while I was flipping through my thin stack of albums, wondering what to put on next. 'I'm not big on classical music,' I replied and went on looking. 'No, I think you'll like this, his second piano concerto.' he took the album out of its sleeve and passed it to me. 'This guy's a real freak'. 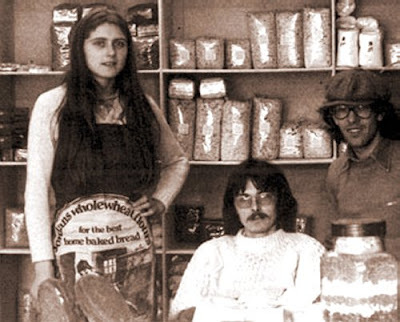 That vignette of university life in 1968 comes from Leaf Fielding's recently published memoir To Live Outside the Law. 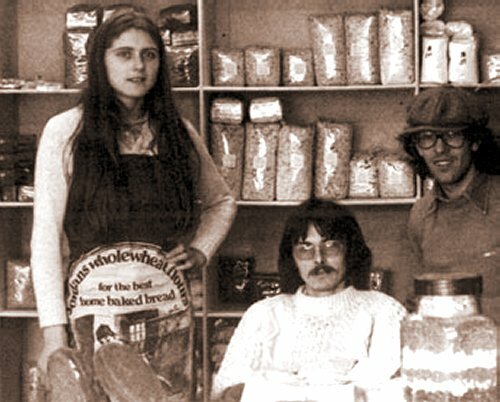 Fielding is in the centre of the photo above taken in Reading Wholefoods - a business he founded - a year before his 1976 arrest and imprisonment for distributing LSD. Reaching new, young and hip audiences is top of classical music's agenda, so it is worth pondering on how much more persuasive 'Rachmaninov was out of his skull' is than the 'Leaf Fielding is listening to Rachmaninov on Spotify' messages that are now the currency of Facebook. Chemical stimulants are most definitely optional; but 'hot' tools such as Norman Perryman's kinetic art can engage classical music neophytes far more persuasively than the 'cold' tool of social media. In the pursuit of trivia it is worth noting that Leaf Fielding was at Reading University, as I was around the same time. Rather more distinguished members of the University in less turbulent times included explorers of music's mystic realms Gustav Holst and Edmund Rubbra.